The Arizona Cardinals already made history by making it to the Super Bowl, but they won't stop there. The Arizona Cardinals, not the Pittsburgh Steelers, are winning the Super Bowl. The Steelers are 7 point favorites, but the Patriots were favored last year too and we know how that finished. 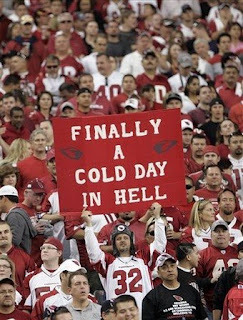 The Cardinals will win due to a few reasons and they all relate, ironically, to classic, old school, rough, physical football that the Steelers are known for. Everyone expects the Cardinals to try to win this game by airing the ball out, which seems reasonable considering they had three different 1,000 yard receivers. They expect to see Kurt Warner chucking balls up to Larry Fitzgerald all night long. That would be ignoring the three great games of football that the Cardinals have played in these playoffs. They've played well balanced football - asserting the running game and stopping it. Of course, the passing game will still be important to the Cardinal's chances. Larry Fitzgerald will probably need a 100 yard game in order to win the Super Bowl. However, is it much of a stretch to assume he'll get that? He's the most talented receiver in the game and is playing out of this world right now. He could very well be the Super Bowl MVP. However, the more important player may be Edgerrin James. His play in the playoffs has been very important to Arizona. The Cardinals have averaged 111 yards per game rushing in these playoffs. This has been huge, and that very well may be an understatement. It has created an offensive balance for Arizona, making their offensive attack even more lethal. They are more than just an air-it-out offense now. They can beat you on the ground and through the air. Its not easy to stop that, let alone contain it. Equally, if not more, important is the Cardinals sudden ability to stop the run. In their three playoff games the Cardinals haven't allowed a single team to rush for over a 100 yards. Arizona has only given up 77 yards rushing per game, forcing teams to beat them through the air. As the Cardinals know themselves, its not easy beating teams with a one dimensional offense. This is what the Steelers are known for, and its how the Steelers will be beaten on Sunday. What adds on to that problem for the Steelers is their very weak offensive line. No quarterback was sacked more times than Big Ben this past year. Roethlisberger spent a whole lot of time laying on his back this year and unfortunately for him there was usually a 300 pound man on top of him. 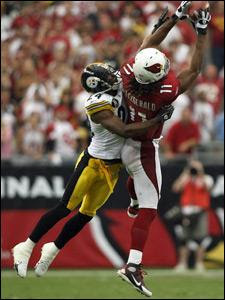 When Arizona stops Willie Parker on the ground, this will become quite an issue for the Steelers. Not only has Big Ben been sacked a ton this year, but as Steve Young has pointed out repeatedly this week, he's been scramble happy. While every once in a while this ends in a highlight reel type play (like the Santonio Holmes TD in the AFC title game), Steve Young and Donavon McNabb both said that this cripples an offense. When the running game is shut down, the last thing the Steelers will need is to have their passing game fall apart. Put all that together and you have yourself the most improbable Super Bowl champion of all time, the Arizona Cardinals. Buzzsaw football would be forever changed, and 2009 would be well on its way to be the strangest year in a long while (or EVAR). The crazy thing is that this is the type of football the Cardinals have been playing in January and that's why they will win the Super Bowl.